Whatever course of evolution college admissions and other selection policies take, they will serve as a meter of the evolution of all the implicit assumptions, tensions, and unwritten policies behind them. This meter must be read with ever-watchful eyes. 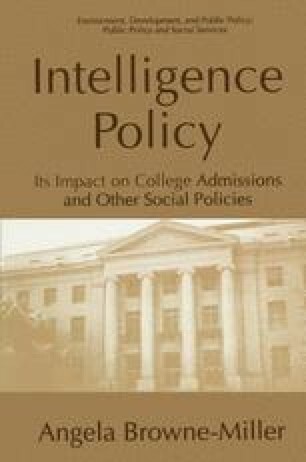 All opportunities for the development of an explicitly articulated intelligence policy must be accepted as a challenge for the betterment of all social policy. The ingenuity of the economists may be said to have postponed recognition of the fact that the most important factor is people—the distribution of intelligence in the people. For the rest of what economics deals with, the rule is allowed to hold that what is valuable and useful will be produced in proportion to the demand for it.